Cheese fondue was always one of my favorite special-occasion foods growing up. Now it’s turned into a romantic treat! 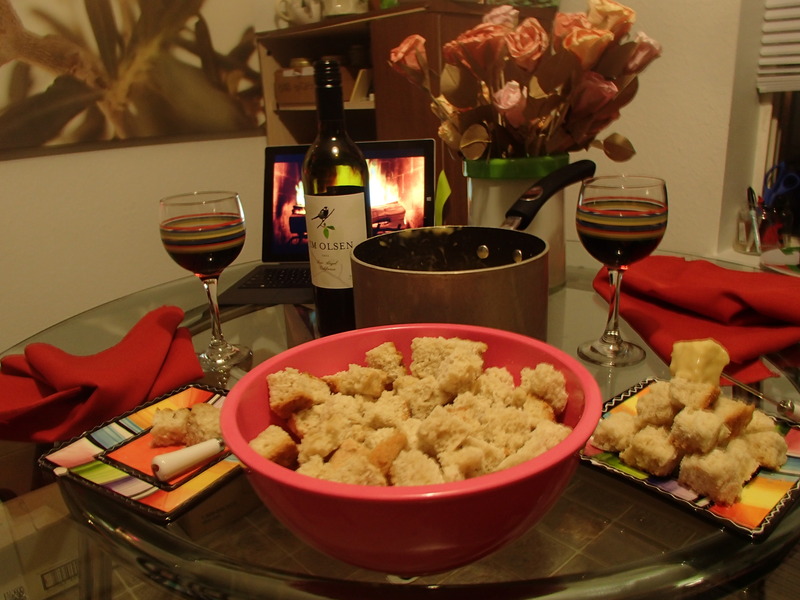 Here’s a great recipe for delicious and creamy cheddar cheese fondue. All you need for dipping is some bread, veggies and a little imagination! Shred the cheddar cheese and put it into a large bowl. Add the flour and shake the cheese around until it’s coated in flour. Heat the garlic clove with butter until fragrant. Add the chicken broth and bring to a simmer. Stir in cheddar cheese until melted and fully incorporated. It should be thick enough to dip things in, but not so thick it turns into a mess. Get creative: use as many of as few items to dip as you want. Sometimes I’m feeling only bread, sometimes apple slices or celery and broccoli.